This guide will help how to backup wordpress database,file and posts.It is critically important for self-hosted wordpress blogs. If your blog is running on WordPress, and if you have good number of posts, then it is definitely a serious matter of taking a backup of your wordpress blog. It helps you feel secure even if have your blog hacked or dumped by chance by the hosting side. You never know what is going to happen with your blog, so every blogger should give priority to backup wordpress. Lets get started with how to backup wordpress database of your blog, all posts and files of your blog, which is mainly the wp-content folder of our blog. 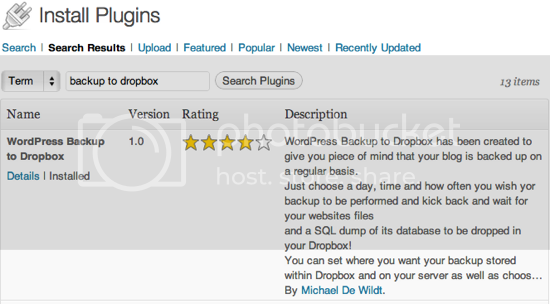 Thanks to WordPress Developers, for creating plugin called WordPress Backup to Dropbox. What it does simply is alongwith backing up all the chosen files of your blog, it creates a database which includes all your blog posts, categories, authors, tags and everything you have on your wordpress blog. Since it backups everything, no need to worry about your effort you made on your blog. The feature that I like about this plugin is it directly backup all these chosen files on your Dropbox account. It makes backups so easy that once after setup, it never needs attention. You can schedule the plugin to take regular backups of your blog, and it will automatically upgrade or upload files on your Dropbox account. Lets get started with how to backup wordpress database with files. 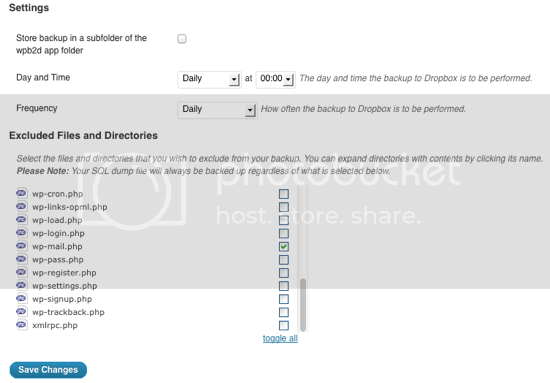 First, Get WordPress Backup to Dropbox WordPress Plugin from the WordPress Directory. After activating the plugin, you will see WPB2D pane in the WordPress Dashboard. Open that panel, before setting up, you will need to Authorize your Dropbox account so that the plugin can automatically store your wordpress blog files in your Dropbox account. Authorize and it will show up the Backup settings. You can set and schedule your backups daily,weekly or monthly at a defined time. Select the directories you want to backup, and if you are not sure, then check the wp-admin and wp-includes folder under Excluded Files and Folders option in the plugin settings. The Plugin will backup all the posts and wordpress data in a SQL Database file and stores it temporarily in backup directory in wp-content folder. The plugin will create a folder named “WordPressBackup” and store all the chosen folders alongwith the database file in the folder. 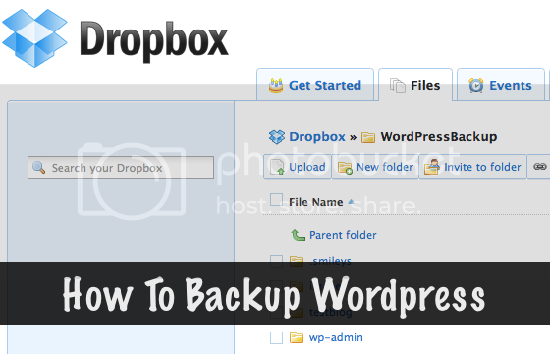 So, with this guide on how to backup wordpress database, posts and files, you can now have full backup of your WordPress blog right into your Dropbox account. 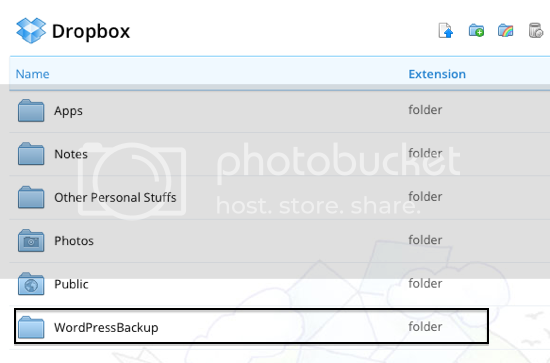 It will also backup selected files and folders of your blog right into your Dropbox account. And you can always restore the database and the files from your Dropbox. Also, the plugin automatically adds or modifies the file after you edit the file in your blog. Thank you for sharing this informative article, i really enjoyed reading about it and learning more from it. Great article. Really good guide to backing up your files. I also upload my files to another file hosting site, like uploaded.net (which I just found a good discount for) or rapid share, just in case.